This property certainly predates the creation of the Hook Heath Estate, and is believed to date from the middle of 18th century. Originally it was a two-roomed cottage with wattle and daub walls, built possibly for use by a forester. At some stage two more ground floor rooms were added in such a way that all four rooms were in a straight line and entered one from another. For the location of Red Cottage see the old map at the bottom of this page. More recently a connecting corridor has been added along the outside of the cottage to give separate access to all the ground floor rooms and a second story has been added above two of them. Although external walls are now of brick, an original wattle and daub wall survives as an internal partition wall, but it is currently concealed from view. Nothing is known about the early owners and occupants of Red Cottage until the beginning of the 20th century when Mr George Tipping of The Star, Wych Hill sold to Francis Herbert Druce Esq., of Orchard Mains, Wych Hill two freehold cottages, outbuildings and gardens (comprising 1 rood and 26 perches in all) at Hook Heath Hill, Woking, Surrey for the sum of £450. The indenture is dated 16th January 1908. The cottages were identified as Bramble Cottage, lately occupied by Ernest Thorn and vacant at the time of sale, and Red Cottage in the occupation of William Giddings junior. On 4th July 1930 Elizabeth Simms Druce, the widow of Francis Herbert, sold Bramble Cottage and Red Cottage together with all the land to Alfred Frank Moulding, Professor of Music, of Dereham, 23 Kingsway, Woking. Less than a year later he sold the properties and land to Charles Campbell Colborne, a builder, of Haverhill, Wych Hill for the sum of £565. The sale is recorded in a conveyance dated 11th June 1931. By this time Bramble Cottage was occupied by a tenant called Baldwin and Red Cottage by a tenant called Green. Their location was identified as Fernhill Lane. 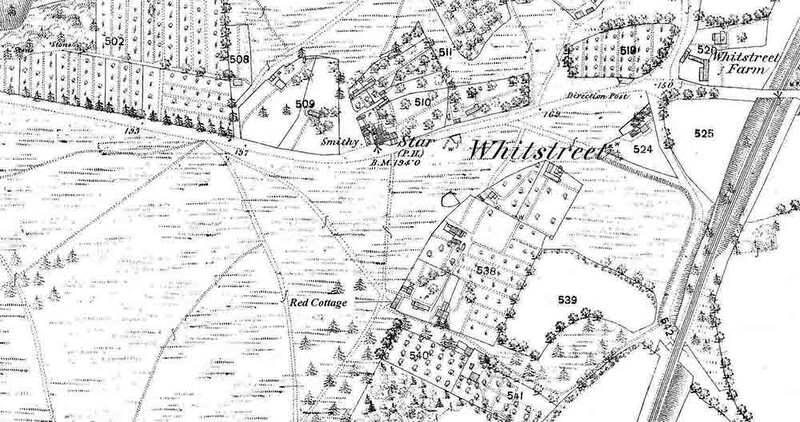 Colborne later sold a strip of land of uniform width (83 feet) along the rear boundaries of Dalehurst (formerly Bramble Cottage) and of Red Cottage to Adrian Bevrill. The deed is dated 8th October 1934. On 28th March 1936 Colborne sold Bramble Cottage and its remaining land having a frontage of 65 feet 6 inches on Fernhill Lane to George Stephen Tanner. William Giddings junior, at one time tenant of Red Cottage, was a member of an extended family group that had settled in the Wych Hill area. In 1891 William Giddings senior, a coal merchant, was living with his wife, three sons, and his brother in Wych Hill. He had been born in Brixton, which was then in Surrey, and had evidently moved frequently as each of his children was born in a different village in Surrey. William junior was working as his father’s assistant, and the middle son, Joseph, was also employed in the business. By 1901, William junior was married and living in Hook Hill Road (in Red Cottage) and was employed as a general labourer. Meanwhile, William senior who had also moved to Hook Hill Road was still running his domestic coal business with Joseph, who was now married with two children and living in Wych Hill Cottage, Star Hill. Ernest Henry Thorn, the former occupant of Bramble Cottage, was a more settled character. He had been born in Send, and by 1911 was employed as a nurseryman labourer and was living in Havelock Cottages, Mayford with his wife and young son, Ernest Henry junior. Francis Herbert Druce, a copper smelter originally from Kent, is recorded as living in Orchard Mains with his wife and daughter and four domestic staff in the 1901 census, and was still there in 1911. He died at the age of 66 in 1929. This website is grateful to https://www.colepotteries.co.uk for permission to use their picture of some old cottages.